It might be a prank, or it might be someone too lazy to properly dispose of an old musical instrument. Either way, residents of Miami, Florida, are talking about the presence of a mysterious grand piano. Grand pianos, in and of themselves, aren’t mysterious, but this one is. 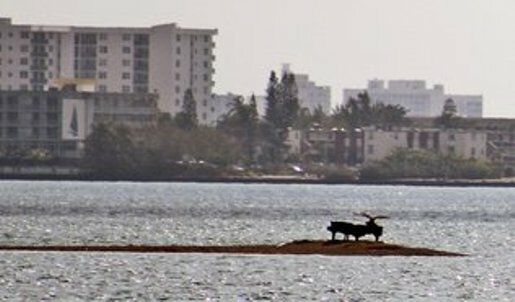 Someone put a grand piano on a sandbar in the middle of Biscayne Bay. At high tide or low, the instrument is plainly visible from the shore and nearby Quayside Condominiums, which are about 100 yards away from the piano. As it stands, the piano is going nowhere and people aren’t really sure how it got out there in the first place. A grand piano like the one spotted in the picture weighs about 650 pounds if you’re lucky, and is very difficult to move. If this is a prank, someone went to a lot of trouble to pull it off, though it is the coolest piano-related thing I’ve seen in awhile. Given the bulk of the piano, it’s not going anywhere. Someone better give Billy Joel a call. I imagine he’s missing a piano right about now.